Now, Only Norton, No Need Other Supplier! You do a nice job, I like you! Most of the knives become blunt in the long run, you can not spend time on always buying new ones for your kitchen. Our Aicok Knife Sharpener provides the best solution for this problem. To use the knife sharpener, each stage gently pull back 1-2 pulls according to the Ceramic, Coarse, Fine order. Not very blunt knife and low-intensity knife can skip the first stage. • 3 Stage Sharpening System - Ceramic, Coarse, Fine. 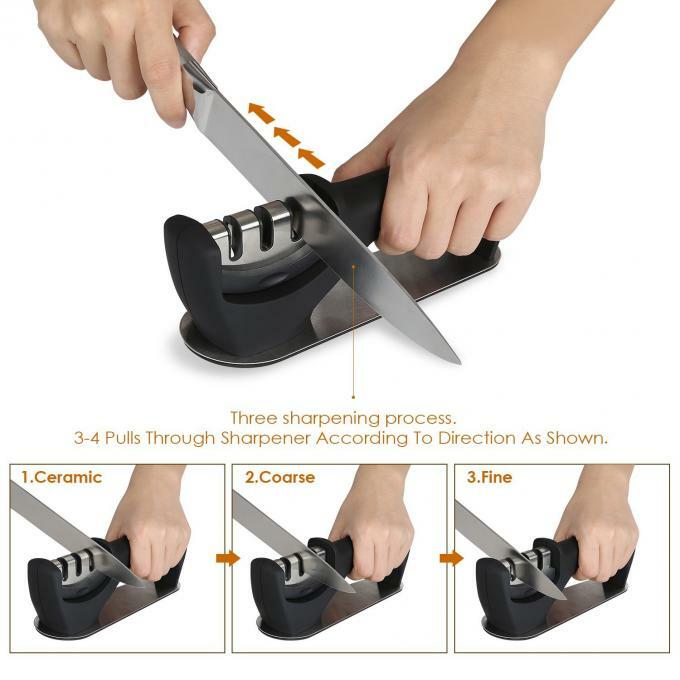 • Sharpens All Knife Sizes - Whether you need a paring knife to slice an apple or a chef's knife to carve a turkey, you'll always have a sharp blade. • For the record, this sharpener can not suit for serrated knife and scissors. • It is perfectly normal for sparks to fly when knives of high carbon steel come in contact with the grinding wheels. • This is an upgraded version, it is easier to use than before. If you see a previous review with the product images do not match with your new Knife Sharpener, don't worry, it is the old version. A 2 Stage Sharpening System - Three sharpening process, Ceramic, Coarse, Fine. Each stage gently pull back 1-2 pulls according to the Ceramic, Coarse, Fine order. Not very blunt knife and low-intensity knife can skip the first stage. 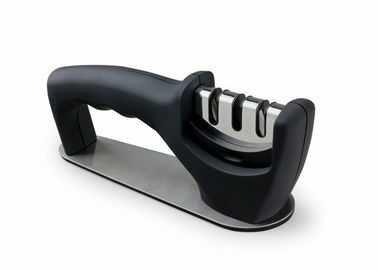 B Easy and Fast - Instant correct sharpening angle when you place your knife. Just 3 to 4 pulls through the sharpener is all it takes to restore any knife to a precision edge. No more grinding and damaging your precious knives with handheld stones. 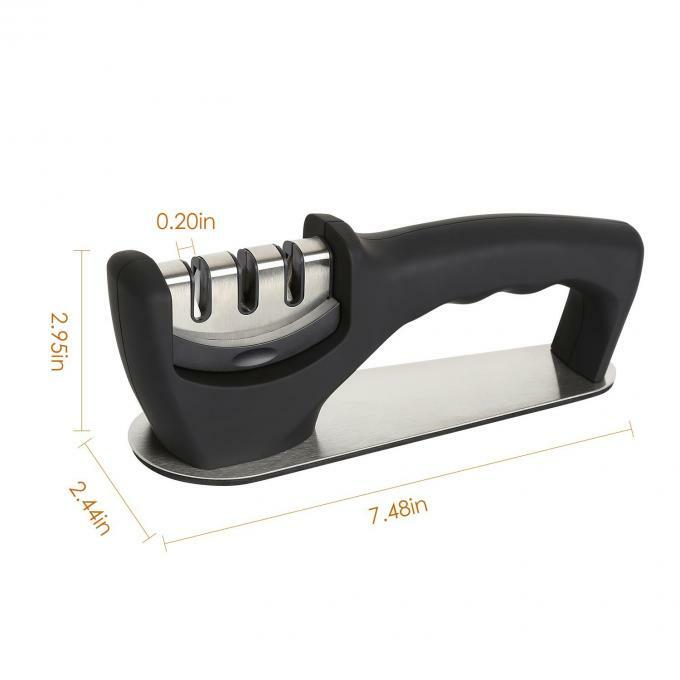 C Comfortable Non-Slip Grip - Ergonomically designed handle with rubber grip that is comfortable to use and the modern looking design will complement most kitchens. D Non-Slip Base - As an added extra to the non-slip handle, the base of the sharpener also has a non-slip surface ensuring that you are in full control of your knife sharpening at all times, keeps everything sturdy and safe. E Sharpens All Knife Sizes - No knife is too large or too small, and it even works on hunting and survival knives, too. But for the record, this sharpener can not suit for serrated knife and scissors. Yuyao Norton Electric Appliance Co., Ltd.
China Good Quality Household Knife Sharpener Supplier. Copyright © 2017 - 2019 householdknifesharpener.com. All Rights Reserved.